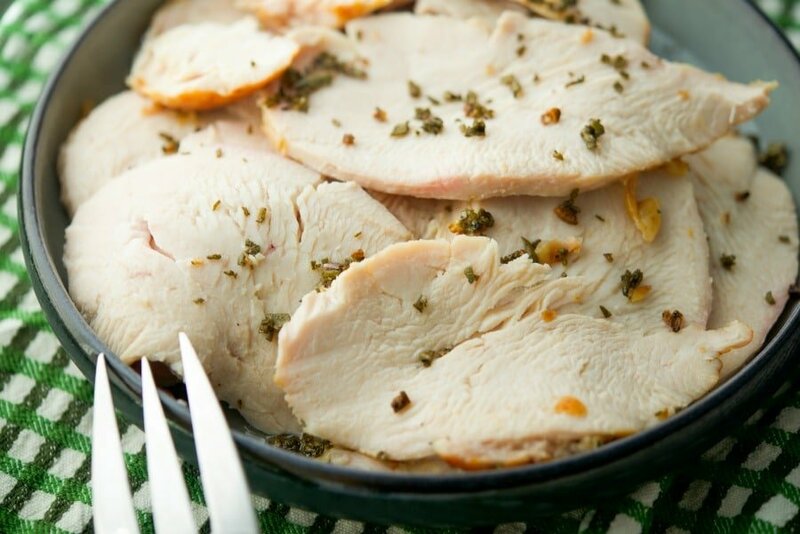 This recipe using fresh sage and minced garlic makes this Garlic & Sage Roasted Boneless Turkey Breast a simple, delicious Fall meal. If asked, I would have to say that September, October and November are probably my favorite months. Not only do I appreciate the cooler temperatures and the leaves changing here in NJ, I just love flavors that remind me of Fall; like apples, cinnamon, pumpkin, maple and sage. 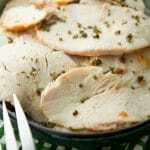 That’s why this recipe for Garlic & Sage Roasted Boneless Turkey Breast makes the perfect Sunday Fall dinner. 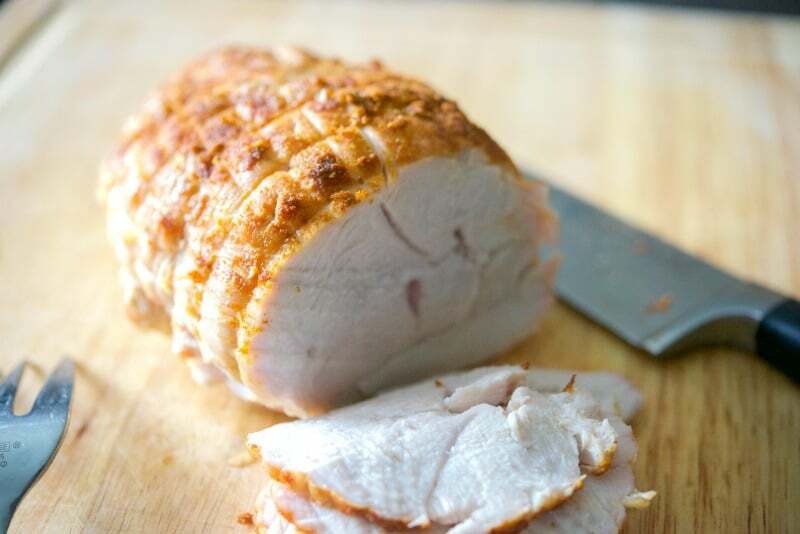 Boneless turkey breasts can usually be purchased at your local grocery store and the one I get is about 2 1/2 pounds; which is more than enough for the four of us. I try to make one at least once a month though so I can use the leftovers in other meals like pot pies, soup, salad and even just sliced on a sandwich for the week. It just makes meal planning that much easier when I can get a few meals out of one dinner. The day I was making the Sweet Potato & Sage Risotto a couple of weeks ago, I decided to use the rest of the sage on this boneless turkey breast too. I just love to use the same flavors in my main and side dishes when serving a meal; it kind of ties everything together. 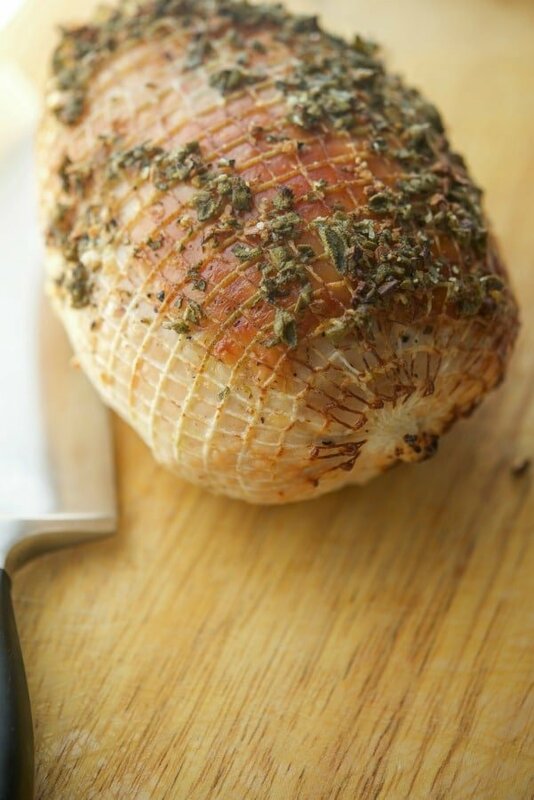 To make this recipe, first preheat your oven to 350 degrees F; then get out a roasting pan and place your turkey inside. The turkey I purchase comes with a netting on it; which I choose to leave on during the cooking process; then carefully cut it away before slicing. 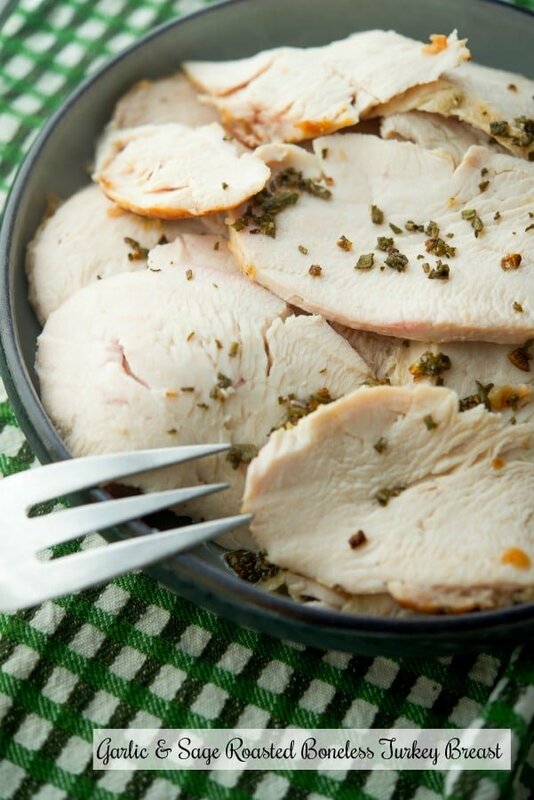 In a small bowl, combine fresh chopped sage, minced garlic, extra virgin olive oil, salt and pepper; then baste it on top of the turkey breast. (I put my turkey directly in the pan; however, you can also place it on top of a rack if you prefer.) Add a little water or chicken broth to the bottom of the pan to help from sticking or if you want to make a gravy afterwards. Cook the turkey for 90 minutes or until the inside internal temperature reaches 180 degrees F. Remove the turkey from the oven and allow to cool for 10 minutes before carving. 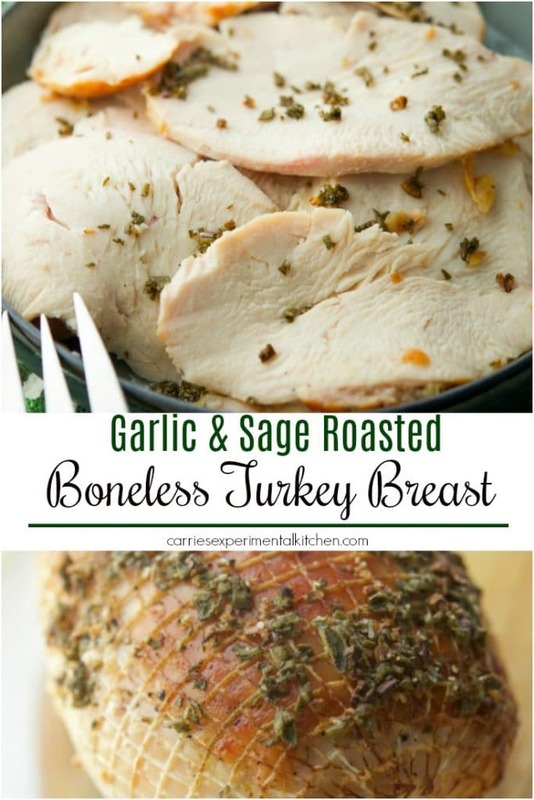 As you can see, this Garlic & Sage Roasted Boneless Turkey Breast is super simple to make and extremely tasty. If you only like the white meat, this would also make a fabulous main entree for Thanksgiving too. ~Enjoy! Preheat your oven to 350 degrees F; then place your turkey inside a small roasting pan. 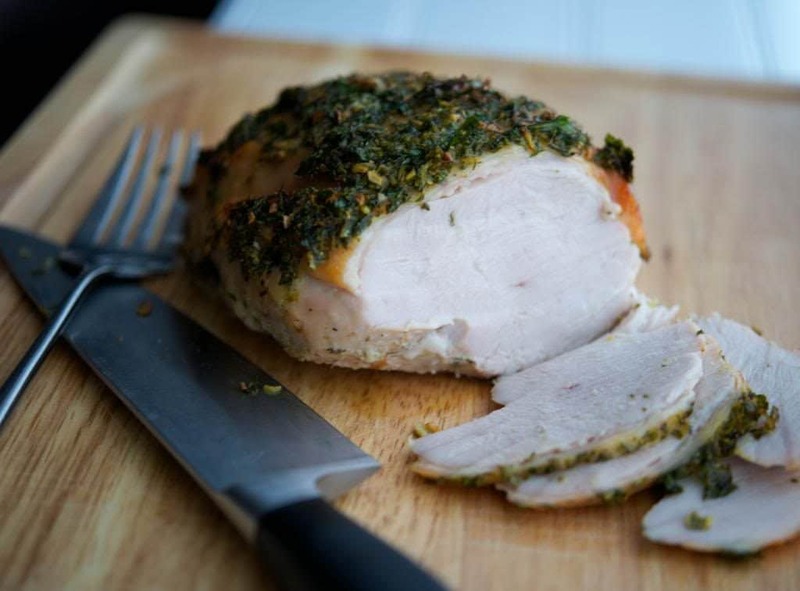 In a small bowl, combine the sage, garlic, oil, salt and pepper; then baste it on top of the turkey breast. (I put my turkey directly in the pan; however, you can also place it on top of a rack if you prefer.) Add a little water or chicken broth to the bottom of the pan to help from sticking or if you want to make a gravy afterwards. Cook the turkey for 90 minutes or until the inside internal temperature reaches 180 degrees F. Remove the turkey from the oven and allow to cool for 10 minutes. Cut off the netting; then carve. 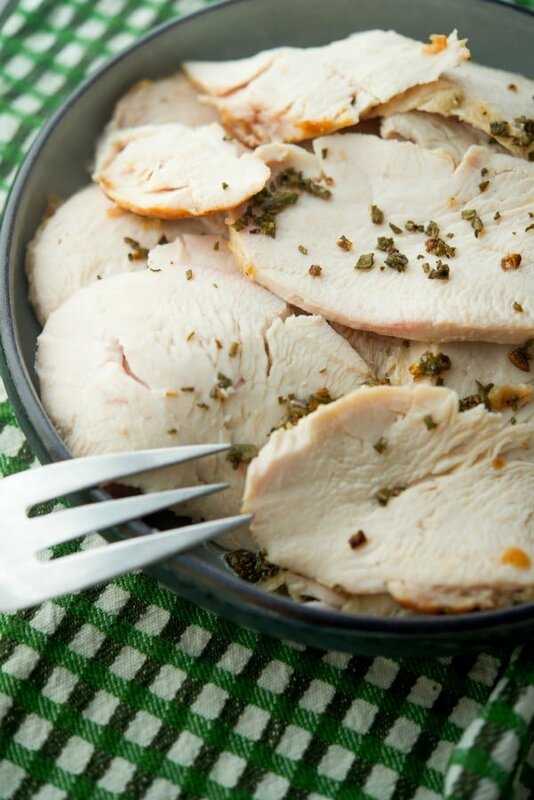 Visit the Turkey recipe section under the Recipe Index or find other poultry favorites on my Chicken & Turkey Pinterest Board!